This endoscope is a new electronic and industrial pipeline detection product, which can capture videos and photos to help you reslove some subtle work. IP67 waterproof,7mm diameter camera head with 6 adjustble LED lights, fully competent for different uses and dark areas. High Resolution Camera, equipped with 2 million pixels CMOS camera and 640 * 480 resolution, provide you HD videos and snapshot images. Support Android Phone has OTG and UVC function, such as Samsung Galaxy S5 S6 S7 Edge, Note 2, Note 3, Note 4, Note 5. NOT support iOS devices; NOT support Android 7.0 or above system, such as Samsung Galaxy S8. Wide Applications: Suitable for HVAC inspection, vent pipe inspection, underwater pipes inspection, car /boat/ aircraft repair or maintenance inspection, dark areas inspection, hard-to-reach or hard-to-see area inspection and so on. Friendly Customer Service: ✉ You are invited to contact us firstly if any reason you are not satisfied, BlueFire Customer Care Department will always by your side when u need. 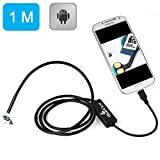 Just download “CameraFi”APP and install it to your mobie phone then connect USB with your mobie phone, now you can use the endoscope for your purpose. Intraoral camera system ; waterproof Micro-cameras;search and rescue ; criminal and custom detector ; archaeological detect ; the PCB detection ; home care ; aviation and space industries ; care and tractors industries ; petroleum drilling industries ; constructions and so on. This entry was posted in Discount Photography and tagged 2/3/4/51M, Android, BlueFire, Borescope, Camera, Endoscope, Galaxy, Inspection, IP67, Note, S5/S6, Samsung, Snake, Waterproof by Ball Photo. Bookmark the permalink.